The overview tutorial below takes less than 10 minutes to watch. It will tell you everything you need to know about your first project with SketchDeck, including what our process is like and how to use our platform. If you're short on time, you will find mini tutorials further down on this page. These are broken down into sections to help you use the SketchDeck platform. Getting started with SketchDeck is easy! In less than 10 minutes, this video will show you everything you need to know about your first SketchDeck project. See it standalone, here. Learn how to place a project. Need to add a new payment method? Click here for instructions. 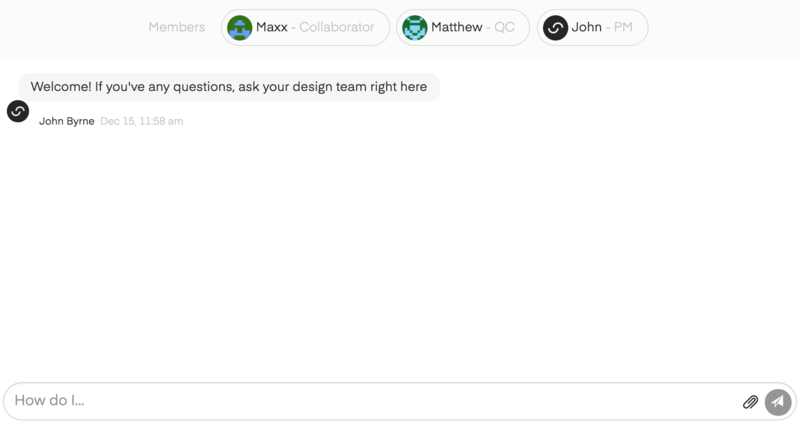 Learn how to provide feedback on your project and chat with your design team. Learn how to add your colleagues as collaborators to your project. Learn how to download your files and mark your project as complete. Don't forget to install the correct fonts as well! Learn how to use the Customer Dashboard. Learn how to invite your colleagues to SketchDeck. If you would like to find out more about any of these, get in touch with us. There are lots of ways to get in touch with us and we love talking to you. You can chat to us from the chat window at the bottom of your customer dashboard, send an email to us here, leave a question or comment in the “chat” tab of your project, or call us at (844) 494-7277. If you have other questions, take a look at our FAQ page.